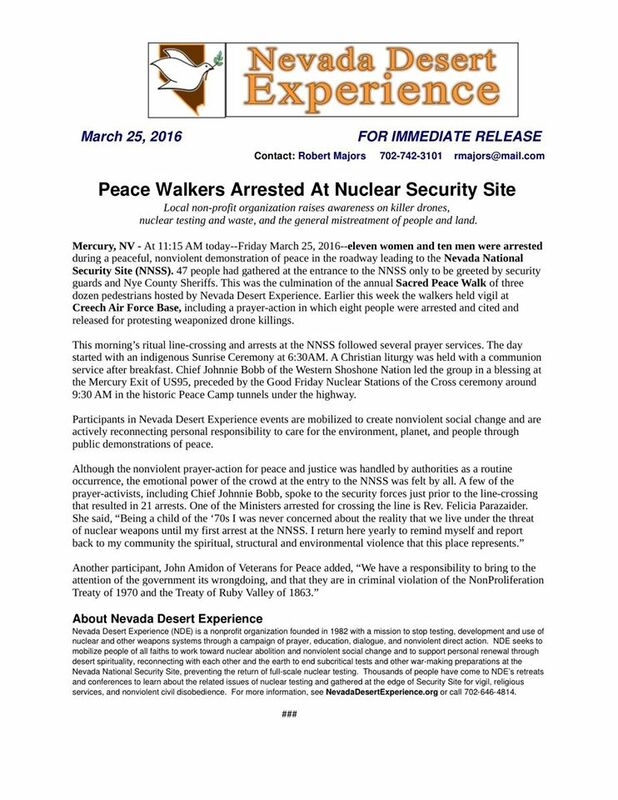 21 peace walkers arrested at the Nevada National Security Site aka Nevada Test Site. 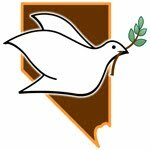 Immediately below are the links to the Nevada Desert Experience Sacred Peace Walk schedule and registration. For years I have been inviting you to this transformative spiritual journey which brings together both the inner journey and outer manifestations of compassionate change, a process of love and affirmation that works so beautifully that many of us return year after year. 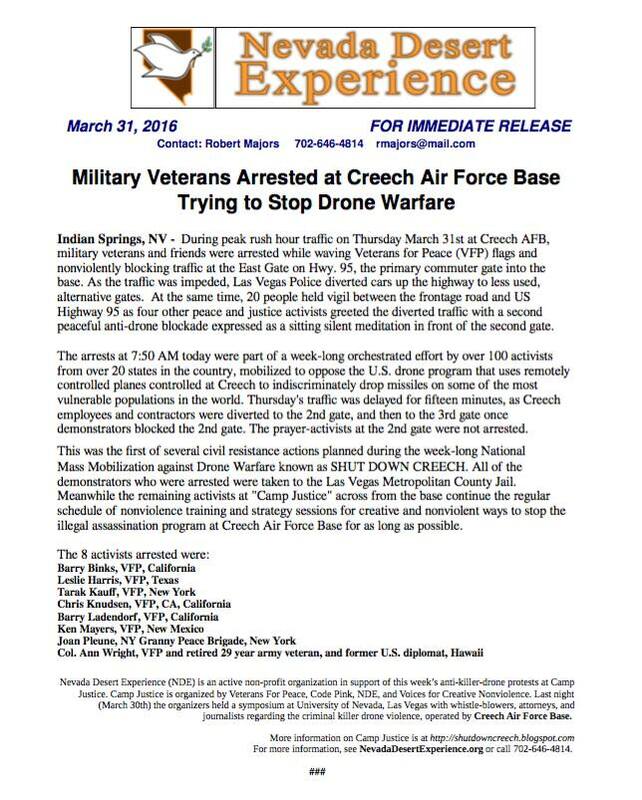 We affirm civil resistance at Creech AFB and the Nevada National Site, (formerly the Nevada Test Site. Everything is here to register, quickly and easily. Please do! 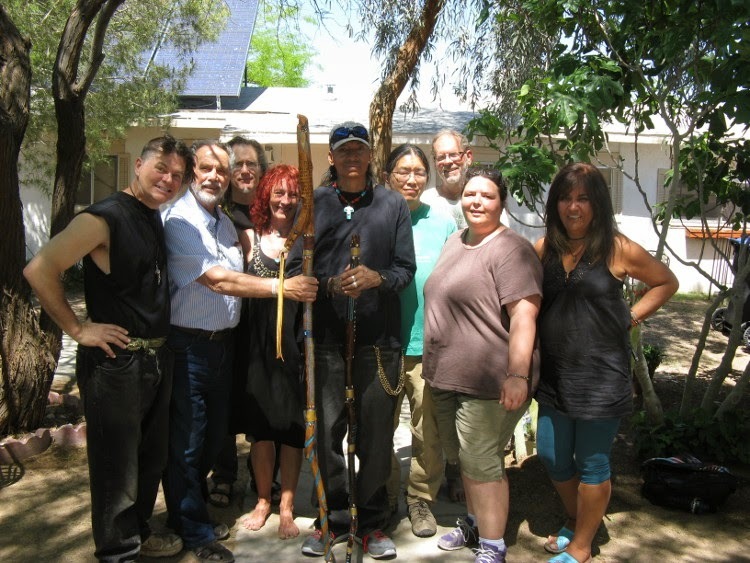 This walk is for all who wish to experience an integrated spiritual experience and who are willing to look into the soul’s mirror under the clear desert sky. This is a walk into the wild and beautiful Mojave. We will meet demons and goddesses and flying robotic killing machines. At the end of the walk we will confront one of humanities gravest mistakes, nuclear weapons. With our gentle and tender love we continue the process of at-one-ment. Please join us and know the joy and hope, the friendship and community which grows so bountifully with each step taken. PS This year we will be joined by members of the 2015 NPT Peace Walk For A Nuclear Free Future For Peace and the Planet, From San Francisco to the United Nations, NYC. How wonderful! Please share this message too! This afternoon the NDE received a very special gift. 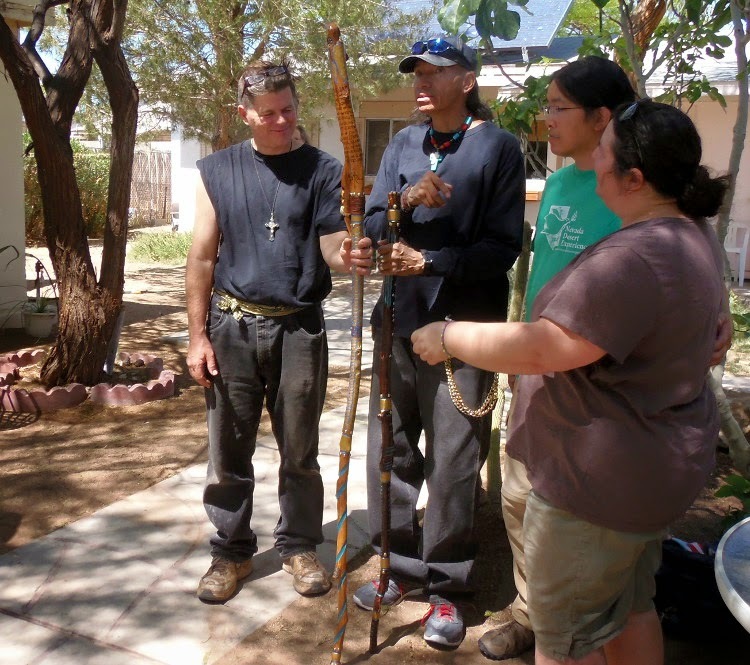 A man named Roland (second from the left) came by and brought handmade staff to guide us on our Sacred Peace Walk. Not only beautiful, but also a magical moment. The man didn’t know us, but just heard a week before that the Sacred Peace Walkers had no staff to guide them. 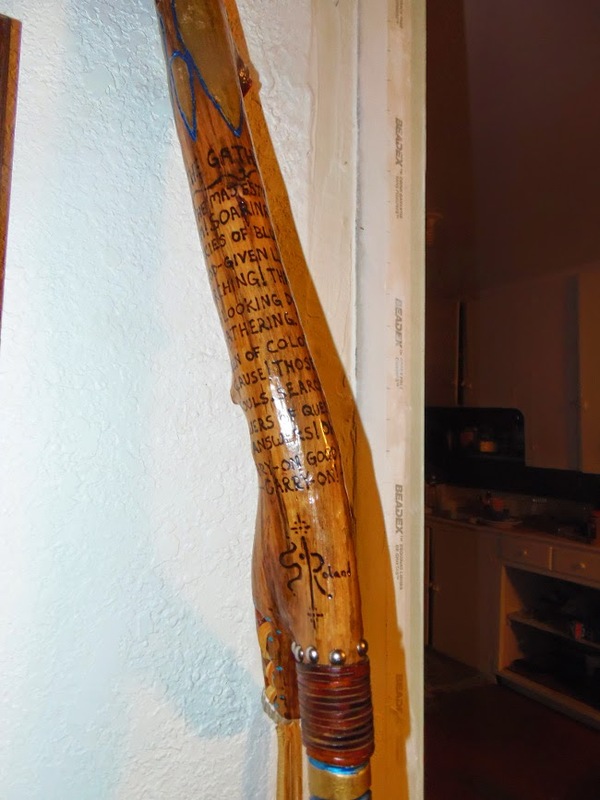 So, he made us one. Thru piercing eyes looking down upon the gathering! Men and women of color, with a cause! searching for answers of questions! On April 12th we start the Sacred Peace Walk to the NNSS. The Schedule of this year’s Sacred Peace Walk can be found here. Get ready for the 2014 Sacred Peace Walk: April 12-18th. More information: please go to the Nevada Desert Experience website!